The story of how a displaced Russian prince and a wealthy British woman came to build a garden in Victoria, BC is filled with tragedy, war, internment in Shanghai during WWII (the Princess), and a meeting, after years of separation, on the top of the Empire State Building in New York. 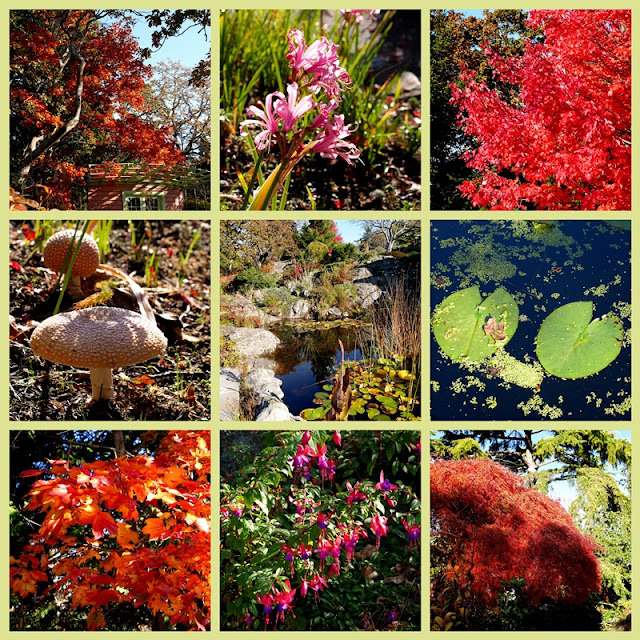 The garden that Peggy and Nicolas spent 40 years developing encompasses just over an acre and is built on a rocky slope where bare granite, narrow swaths of lawn, Garry Oaks, rhododendrons, and pools of water dwell in harmony. On a very sunny, warm Sunday afternoon, Tim and I visited the gardens. The noise of the squirrel caused us to look upwards and we watched him gathering bunches of leaves in his mouth. It didn't look like there were any acorns attached, but he looked like he knew what he was doing. Tim had made reservations for tea, and after our stroll we entered the Prince and Princess's house where we sat in their sun-drenched living room and enjoyed tea while looking at the gardens they created. Tea was lovely, with all kinds of treats, savoury and sweet, and a delicious tea blended especially for Abkhazi Garden. I felt very spoiled. We looked at the books, china and photographs displayed on shelves. I was tickled by the title of one book "A Sense of Humus" written by Bertha Damon , and enjoyed reading a little more about the author. Just to clarify - this wasn't Butchart, but a much smaller garden in the heart of the city. Abkhazi Garden is not as well-known, but still interesting to visit. Every garden should come with its own romantic history. And cream tea. Great big, duh! I just realized that it wasn't Butchart... Still love your photos and especially the one of you with teacup in hand. And would still love to get to Butchart, too, but also Abkhazi now. What a romantic story... they should make a movie about it! It would certainly be more compelling than some of the movies out there these days and can you just imagine the visuals. I just thought it must be one of the gardens in Butcharts many spaces, but looked it up and realized it wasn't! What a special romantic love story - I am so pleased that in the end they were able to spent 40 years together creating their beautiful garden. The garden stands as a testament to their enduring love. Wonderful symbolic images. The garden is lovely, and the treats for tea scrumptious. That sounds like a wonderful place! I love a good tea. One of my favourite pastimes, gardens and afternoon tea. Looks beautiful. What an amazing story! That garden looks lovely and so does your tea! You look fabulous in that lovely blue! I've read the book she wrote about her time in the interment camp, and then one about the house and garden they built in Victoria and their life there, all so interesting. How wonderful to be able to have tea looking out on to the stunning garden - on my list if I can get back to your area! It looks like a wonderful day together. We have a similar garden right in our city just an acre with a house on it, built over time by a couple who gave each other garden things for birthdays and Christmas--they had no children--and it was particularly designed to be welcoming to the birds. One favorite one she welcomed into her house and he would bathe in a china saucer on her bathroom sink. It's a lovely place to visit, and if they added afternoon tea it would be even better! To be able to visit a garden as lovely as this is a treat, to be able to enjoy afternoon tea in their home afterwards makes this afternoon just perfect. Thank you for taking us along with you on Mosaic Monday. Beautiful garden and I'm so glad you shared the story behind the gardens. Me and my 3 Russian sisters stumbled on that garden on a cold, rainy day in April of 2011. It really wasn't open. Then we walked to have tea at the White Heather Tea Room. Such a lovely place to wander and then to see your tea tray...my goodness that is a spectacular way to spend an afternoon! I must go there again....thank you for the tour. One of my favourites, too. I hadn't thought of a fall visit! It looks like perfect weather for enjoying a day outside. I love the late summer colors mixed with Fall colors. And how nice to have tea with your honey! Hugs! Oh my, I must visit this garden when I next come to Victoria. How lovely to view it too over tea time. My kind of day. Thanks for sharing it with us. Just gorgeous! What a lovely day .... high tea is an amazing experience .... one I would love to experience far more often than has been my fortune. Beautiful garden spot and one we didn't even know about. One more reason to know that it has been wayyyy too long since we've been in Victoria. (My favorite time there was when we spent the week between Christmas and New Year's there, staying at the Empress. 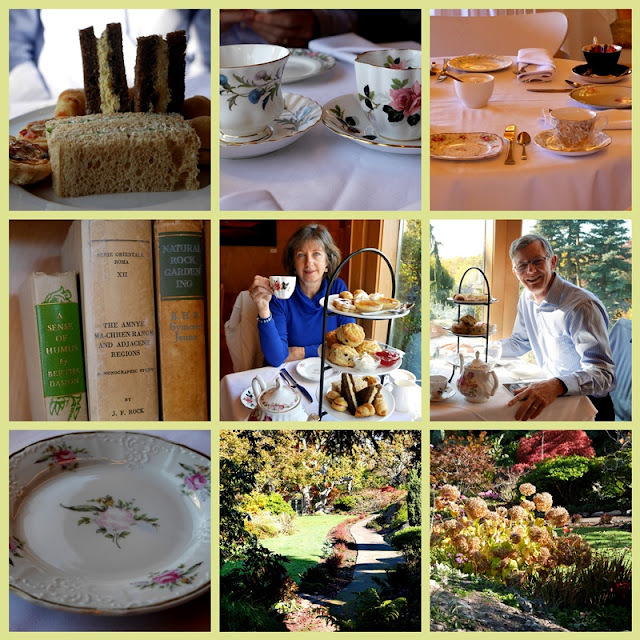 And enjoying two of the handful of high teas we've experienced!) And of course much more besides. It's a wonderful place. That story is the stuff of fairytales. Fascinating! What an enchanting place... and story. This post makes one dream, of wonderful gardens and scrumptious afternoon teas. Thank you so much for sharing! Sounds like a lovely day and a fascinating story! I'll have to find out more. Hope you have a good week. One day I'm going to visit these gardens! Beautiful photos. The tea room sounds perfect ... great photos of you and hubby. A fantastic post with wonderful photos! I am so intrigued! That place is going on my Must See list for the next visit to Victoria! It would be more my speed, or size, than the Butchart Gardens, which I found to be just "too much" to take in on a short personal visit. I guess that is why I also like your posts about those vast plantings, because you share just a small gift of their beauty which I am more capable of appreciating. Lorrie - 40 years - that is quite the labor of love, and it shows. What a glorious way to spend a day - a stroll in the garden and tea in the 'sun-drenched' living room. I can feel the warmth! It is pleasant to be spoiled every now and again, isn't it? Well done to your hubby! What a lovely day you had and it is illustrated so nicely in your collages. The history of the garden is fascinating. What a lovely post - such a sweet day for you both. Lovely lovely photos. Another beautiful garden tea that I've added to my bucket list. Thanks for sharing, Lorrie. HERMOSAS FOTOS!!! !Y LOS PASTELES DELICIOSOS.